Tommy Bond was one of the first curveball pitchers. Born in Ireland, at age 18 he joined the 1874 National Association Brooklyn Atlantics. He is the first person born in Ireland to play Major League Baseball. He remained with the Athletics when it moved to Hartford in 1875 and became a pioneer entry in the NL in 1876. He was with the Boston Red Caps from 1877–1881. He was virtually his team’s only pitcher for most of his career, particularly while with Boston. 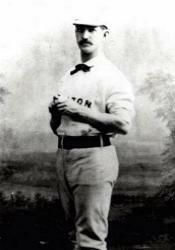 In 1880 Boston was shut out in eight of Bond’s games, and Bond began phasing out his pitching career. He coached at Harvard and was a New England League umpire in 1882-83. He lived to be the last survivor of the National League’s first season.